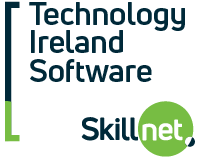 Technology Ireland Software Skillnet is a learning network for companies of all sizes in the software sector. The objective of this national network is to maintain Ireland’s position as a leading location for software companies, by supporting the growth and competitiveness of software enterprises through cutting edge and highly specialised education and training. The network supports indigenous and multi-national companies involved in the design and production of high-end technology software systems, solutions and services. Technology Ireland Software Skillnet is promoted by Technology Ireland, an Ibec business association. Membership of the network is open to private enterprises in the software sector based in the Republic of Ireland. Technology Ireland Software Skillnet really takes the time to understand and tackle our specific business needs. We share many challenges with other technology companies within the network and through it’s collaborative nature, The Skillnet creates real-world solutions that drive tangible business metrics and outcomes. Our employees have participated in a wide range of technical and soft skills programmes with the Technology Ireland Software Skillnet. Key employees in our business have completed Postgraduate and Masters programmes through the Skillnet and our senior managers have participated in executive coaching. This training has been a huge benefit for our business and employees.